In William Shakespeare's tragedy,Hamlet, Hamlet's potential wife Ophelia goes mad after her father's death. Her father, Polonius, had been murdered by Hamlet himself. Ophelia is then said to have climbed a willow tree by a brook, fell into the brook when the branch snapped off, and drowned. 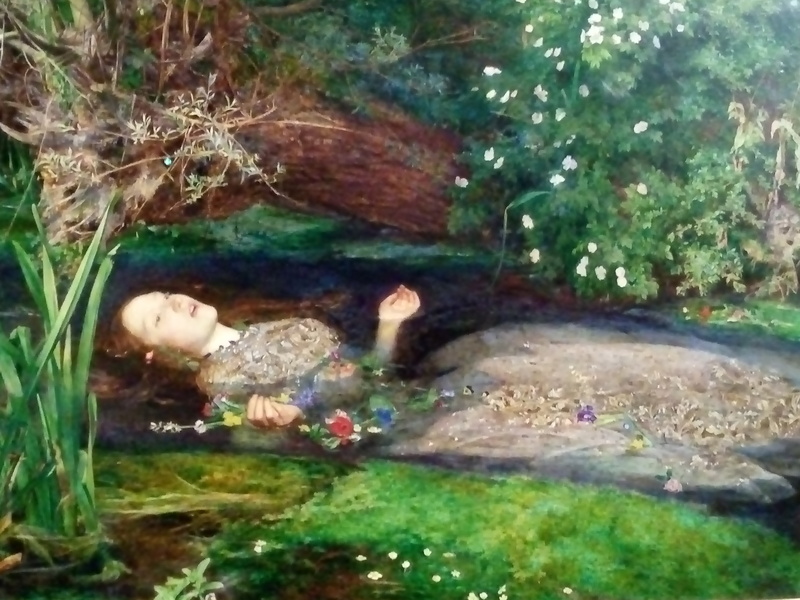 Ophelia's fate became the subject of a famous painting by English artist John Everett Millais in 1851-2. The painting, Ophelia, is one of the most important and popular artworks of the mid-nineteenth century. 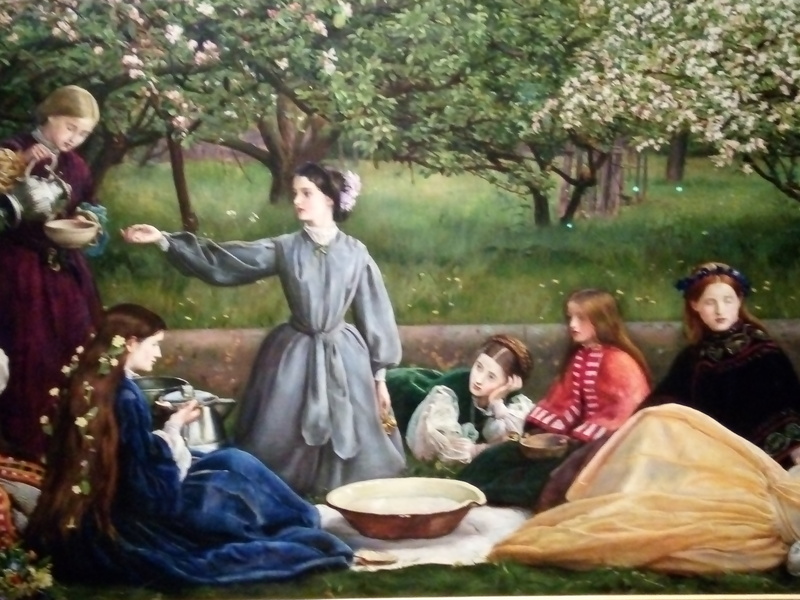 And you can now see it for yourself right here in Canberra at the National Gallery of Australia's 'Love & Desire: Pre-Raphaelite Masterpieces from the Tate' exhibition. Love & Desire' is the National Gallery of Australia's latest blockbuster exhibition. It brings together exclusive masterpieces from the Tate's Pre-Raphaelite collection. The Tate is an institution of four art galleries in the UK, housing an outstanding collection of British art from the year 1500 as well as international modern art. Its collection of pre-Raphaelite masterpieces are rarely lent and many have never been to Australia before, making the 'Love & Desire' exhibition a truly unique, once in a lifetime opportunity. 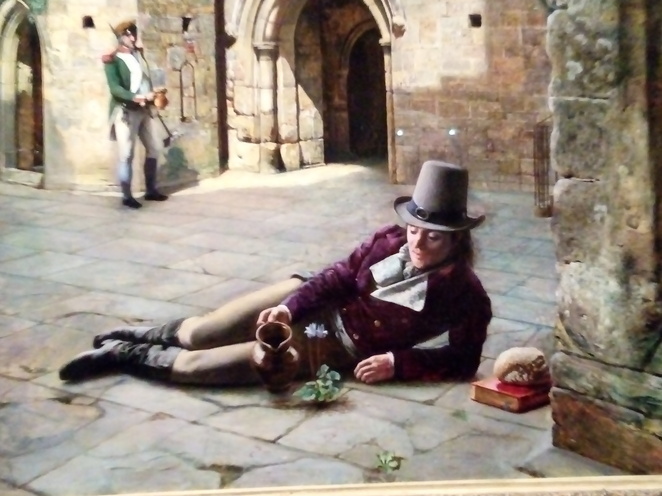 In mid-nineteenth century Britain, a group of rebellious young artists protested against the conventions of the art establishment and society at large at the time. 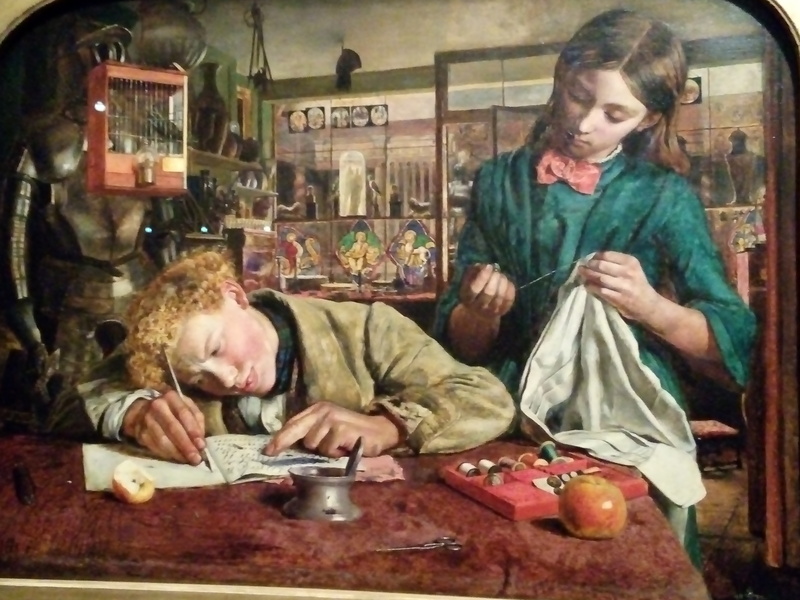 They were John Everett Millais, William Holman Hunt, Dante Gabriel Rossetti, James Collinson, Frederic George Stephens, William Michael Rossetti, and Thomas Woolner. 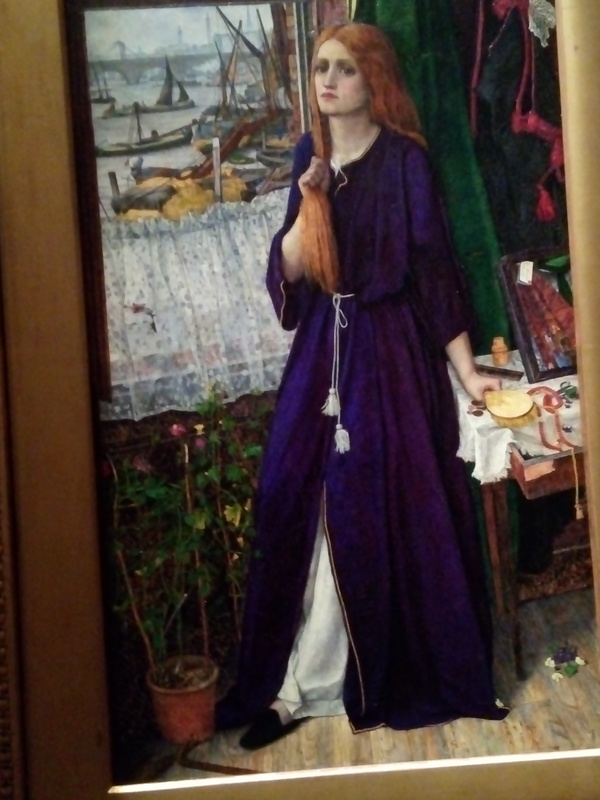 Together they formed the Pre-Raphaelite Brotherhood and signed their works with the letters 'PRB'. The Pre-Raphaelite Brotherhood and their circle sought to emulate the spirit of early Renaissance painting. Their paintings used brilliant colour, raw truthfulness and attention to meticulous detail. The Pre-Raphaelites were inspired by literature and the great tales of tragic love and romance, not only by those of Shakespeare, but also of Robert Browning, Alfred Tennyson, Thomas Malory's retelling of the tales of King Arthur, and John Keats. 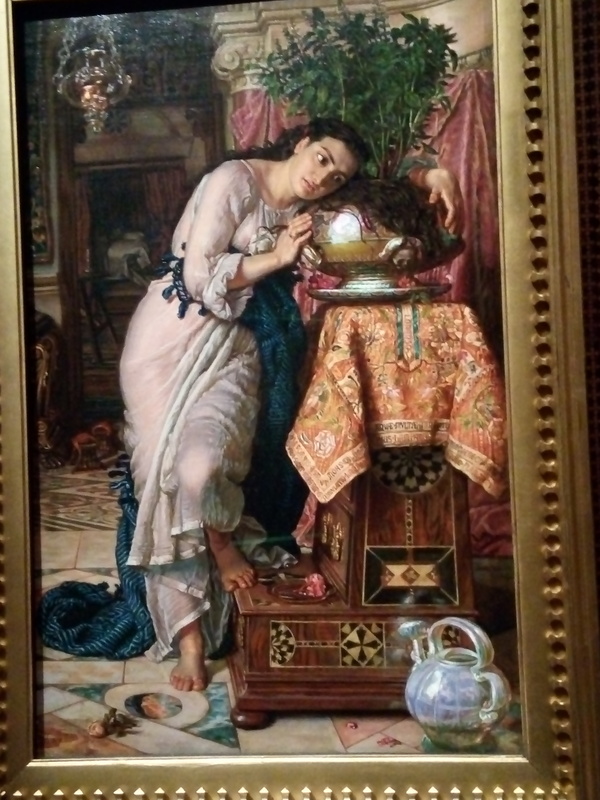 This painting is by William Holman Hunt (1867-8) entitled Isabella and the Pot of Basil. The painting illustrates a retelling of a story in Giovanni Boccaccio's Decameron (1353) published in 1820 by the Romantic poet John Keats, whom the pre-Raphaelites idolized. In the poem, Isabella falls in love with a servant, Lorenzo, outraging her brothers who then decide to kill him. Lorenzo's ghost guide her to his grave where Isabella digs up his corpse and cuts off his head. She takes it home secretly and buries it in a pot of basil. 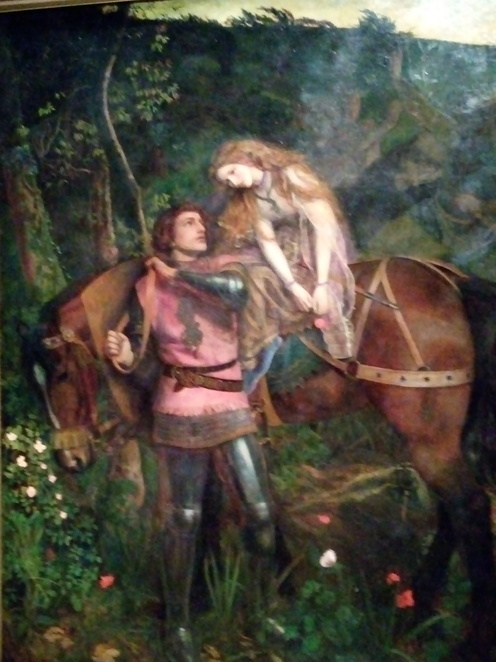 Another John Keats' poem, La belle dame sans merci, is the subject of this 1863 painting by Arthur Hughes. Medieval subjects also featured prominently in the Pre-Raphaelites' works. 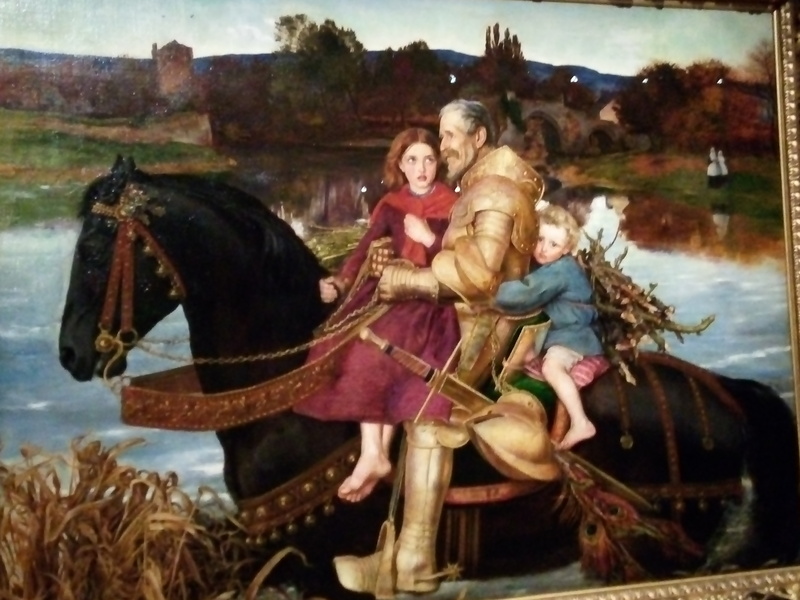 Such as A dream of the past: Sir Isumbras at the ford, painted in 1857 by John Everett Millais. 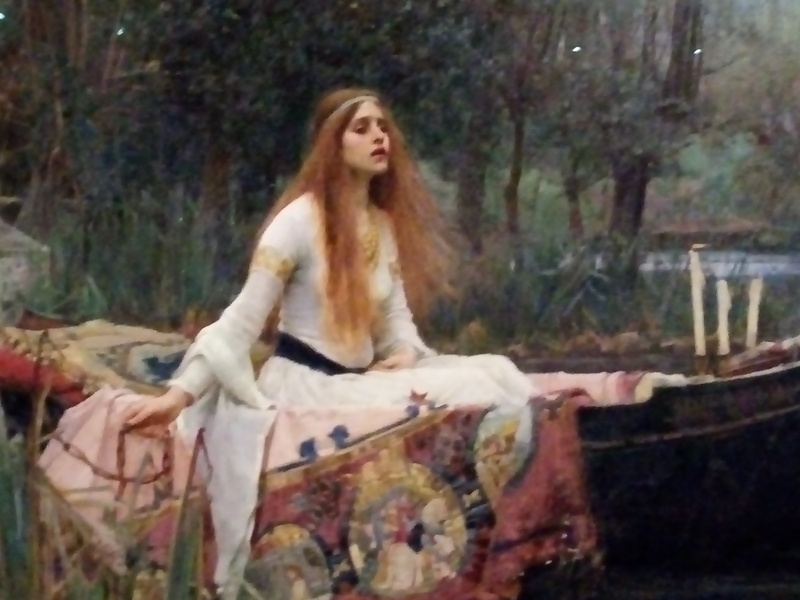 And of course, in John William Waterhouse's famous 1888 painting, The Lady of Shalott, which is set during the time of King Arthur and is based on the poem by Alfred Lord Tennyson. The poem tells the story of Elaine of Astolat, a young noblewoman imprisoned in a tower on an island near Camelot. She can only watch the outside world through a mirror and must weave what she sees. 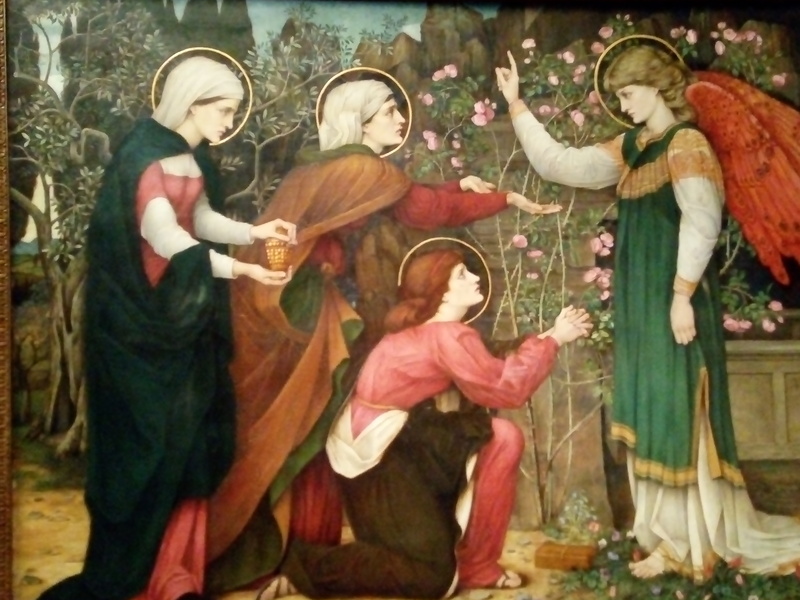 Religious themes and biblical scenes were also very popular with the Pre-Raphaelites. 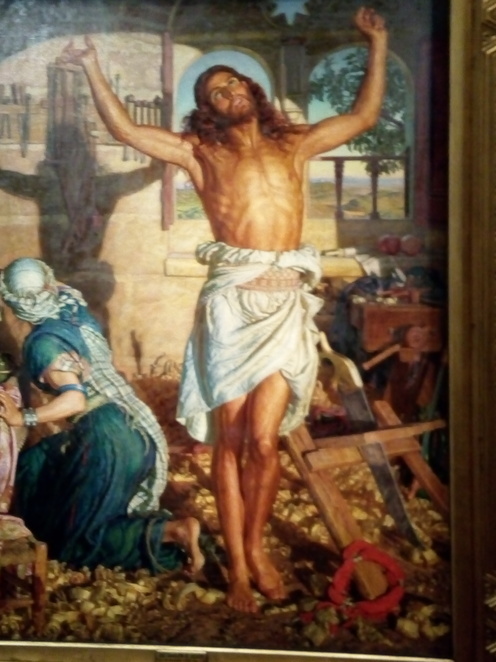 Such as William Holman Hunt's 1870-73 piece, The shadow of death. And John Roddam Spencer Stanhope's Why seek ye the living among the dead? (c.1875 or 1890) which illustrates the morning of the first Easter when Jesus' female disciples visited his tomb and discovered that it was empty. 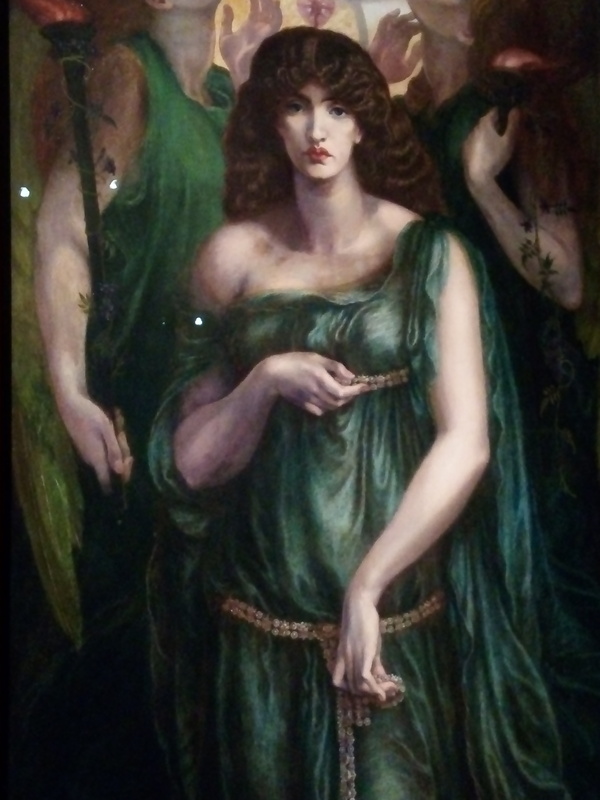 Mythological subjects featured in many of the Pre-Raphaelites' works too. 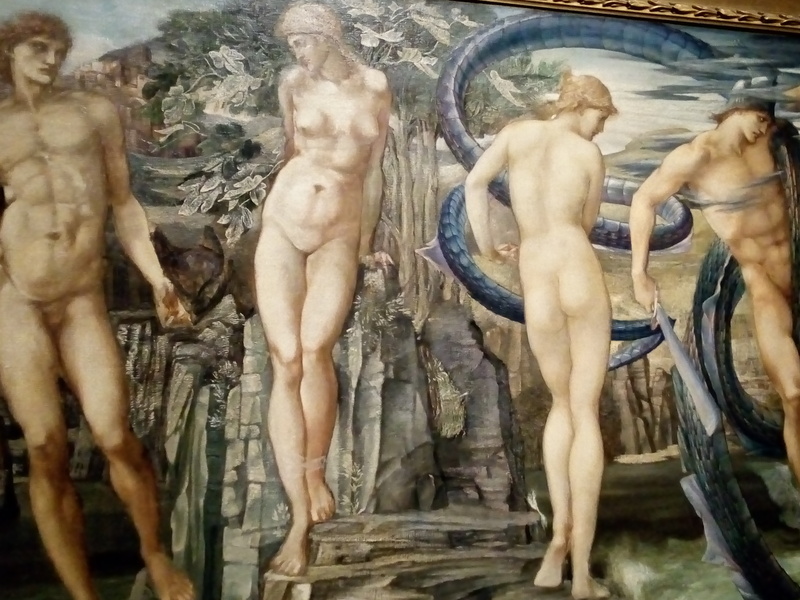 This is Edward Burne-Jones' 1876 depiction of the classical Greek myth of Perseus and Andromeda. 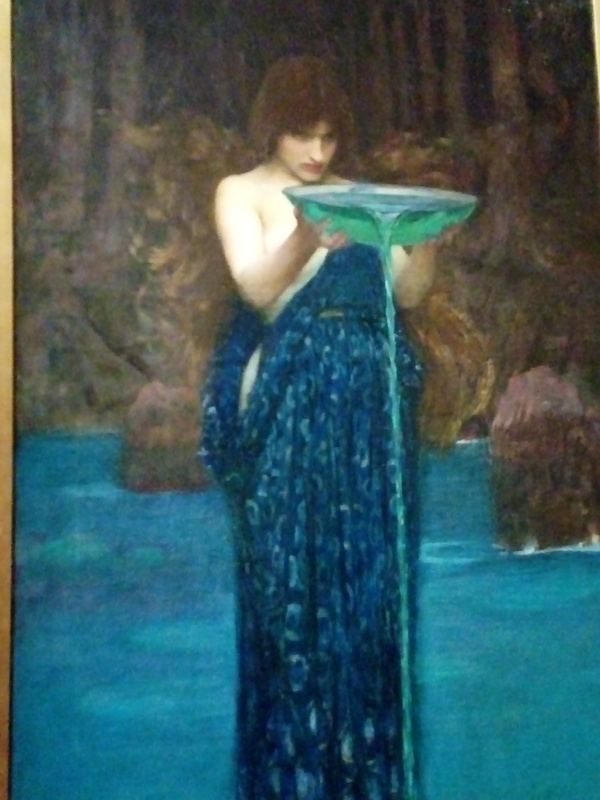 And this is John William Waterhouse's 1892 piece Circe invidiosa which depicts Circe, a goddess of magic or sometimes a nymph, witch, enchantress or sorceress in Greek mythology. Furthermore, the Pre-Raphaelites lived during a time in Britain when their society experienced rapid development accelerated by the Industrial Revolution. And so they captured the realities and aspects of nineteenth century life in many of their works. These and many more outstanding works of the Pre-Raphaelites are now on display at the National Gallery of Australia until April 28, 2019. Adult tickets are $25, concession $22.50, and children under 16 free. You can book your tickets online here or in person at the National Gallery. For more details about the 'Love & Desire: Pre-Raphaelite Masterpieces from the Tate' exhibition, please visit the National Gallery of Australia's website. Cost: Adult tickets are $25, concession $22.50, and children under 16 free.